My Dad makes the BEST pizza in the world. Like, last-meal-ever-quality pizza. As kids, my siblings and I always begged him to make his pizzas for our birthday parties and many of my friends still remember his creations. His crust is fluffy and thick and he piles on the cheese. Secret time: I have always been a plain cheese freak. (“Did anybody order me a plain cheese?” Name that movie.) Although everyone else always complains about how unoriginal and boring that is, Dad would usually humor me and throw one in. 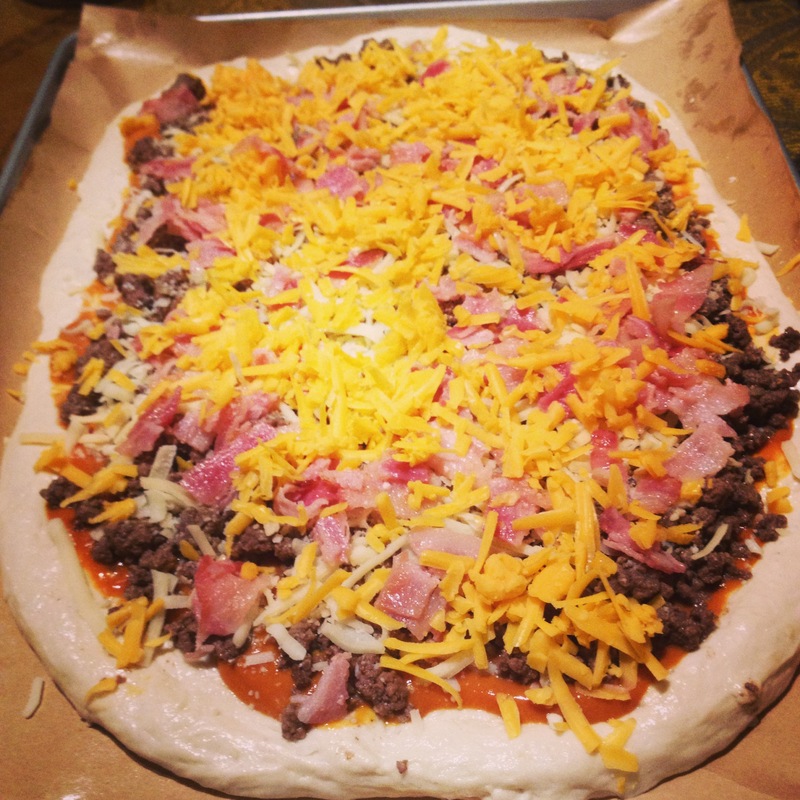 As a grownup, I tried many times to make really good homemade pizza but never succeeded. I tried a few dough recipes but was admittedly intimidated. When I get home from work, the last thing I want to do is mess around kneading dough and waiting for it to rise. I kept hearing about Jim Lahey’s No-Knead Pizza Dough. It sounded simple and I liked that I could mix it up the night before and assemble my pizza once I got home from work. The first time I made it, I was already won over by its simplicity before even having a taste. After the first bite? Hooked. This dough is insanely delicious. It is crisp, chewy, bubbly and the perfect vehicle for whatever toppings your heart desires. My next goal? Trying to get my Main Taste Tester to eat a plain cheese version. Mix dry ingredients in a bowl. Slowly add water and mix until a rough, lumpy ball forms. Cover bowl with plastic wrap and let rise at least 18 hours in a warm place. Once dough has at least doubled in size, break it in two balls. Using the first dough ball, make it a square shape and pull all 4 corners to meet each other, forming a rough ball. Repeat with second ball of dough. Let dough rest covered for an hour or so until soft and easy to work with. Meanwhile, preheat the oven to 500-550 degrees. Once dough is rolled out and topped as desired, bake for about 10 minutes until crust is crisp and bubbly. I like to broil the top for a minute or two as well.